I really didn’t think I needed to learn how to do this. It’s the one thing “everybody” knows about sewing, right? 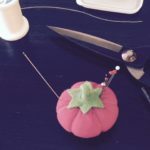 Most people who contemplate sewing start by understanding that thread has to go through the eye of the needle, and they’ve got a pretty good idea of how to get it there. Nevertheless, there are things that make threading the needle easier, and there are ways to thread that will make your sewing easier. Read on, Gentle Reader. First things first. 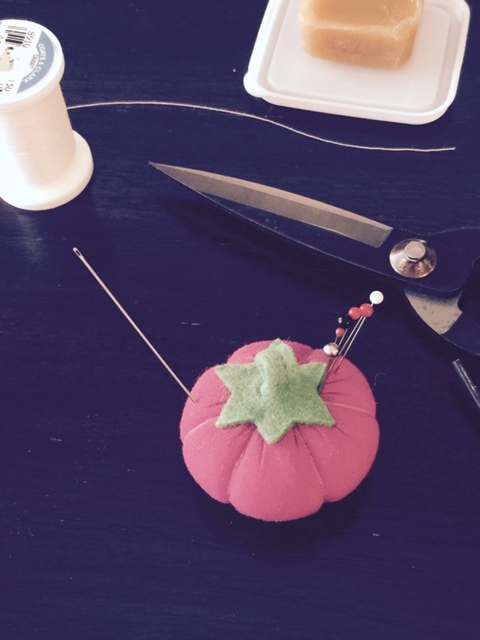 Gather the usual suspects — needle, thread, pin cushion, scissors, and a lump of beeswax. (More about the wax in a couple of paragraphs.) The obstacle that most people encounter when beginning to sew is that most of the time, thread doesn’t want to go into a needle. 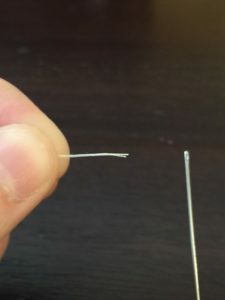 Tiny, tiny fibers stick out a bit from the thread, and they prevent the thread from going through that little hole in the same way that a cat’s legs, properly splayed, can keep it out of the sink indefinitely at bath time. (Skunk. Don’t ask.) Therefore, the first trick that most people learn is that saliva will get those little fibers in order. 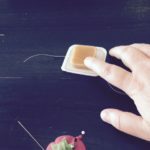 You can apply it by sticking the tiny tip of thread into your mouth and then pulling it out from between your lips, or by wetting your finger and thumb and using it to pinch the end. Those of us who say ew at such things soon learn the second trick of sewing: beeswax works just as well. A lump of beeswax is a glorious thing to have. 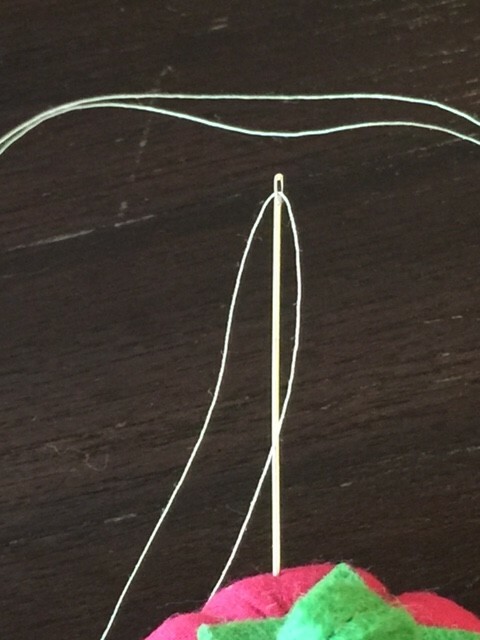 Not only does it make threading the needle easier, but if you coat the entire thread instead of just the tip, it will strengthen the thread slightly, making a stronger garment in the end. Get some beeswax. If you ever see me at an event, ask me for some — I probably have a couple of extra lumps to hand out for just such an occasion. You can also get beeswax at sewing stores, but don’t. They’ll sell it to you for about $2 for a small lump, and it’s very hard. You want natural beeswax because it’s fairly soft, so that you can warm it in your hand and re-form it after you’ve drawn your thread through. It’ll last longer that way. You can usually get that from either a farmer’s market or a beekeeper. Some sell it for around $5/pound and some for around $20/pound. Let me assure you, if you’re paying $2 for the ounce-or-less you get at a sewing shop, or $5 for the 2 ounces you can get from various online shops that cater to those who need tiny amounts, even $20/pound is a better deal. A pound is 16 ounces. Divide that by four, and you get $5 for 4 ounces, which is half the cost of the online 2oz lumps and a quarter of the cost (or less) of what you’ll pay for the really low-quality stuff you get at a sewing shop. Update: Bonnie Raymond, a loyal reader and good friend, has heard that Norse women used to ‘wax’ their threads by drawing them across their foreheads to pick up skin oils. If you have oily skin, I think that’s a smart way to put that trait to work. No more or less ‘ew’ inspiring than saliva, to my mind. By the way, another thing that helps in threading is to have a clean cut in your thread. Use sharp scissors, and pull the thread taut when cutting. If you’re pulling the first cut of the day from a spool that’s been knocking about in a tin box for a few months, the end will probably be frayed, so cut off a millimeter or two until you get a good sharp end. Now you get to make a choice. Would you like your thread to be single or doubled? Single thread means that you use half as much thread, but the seam won’t be very strong. Doubled thread means that your seam will be stronger, but you’ll use twice as much thread. 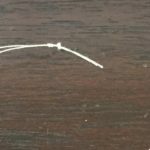 Personally I’ve never been comfortable with a single thread, but you should decide for yourself. If it’s the single thread you want to try, go for it. 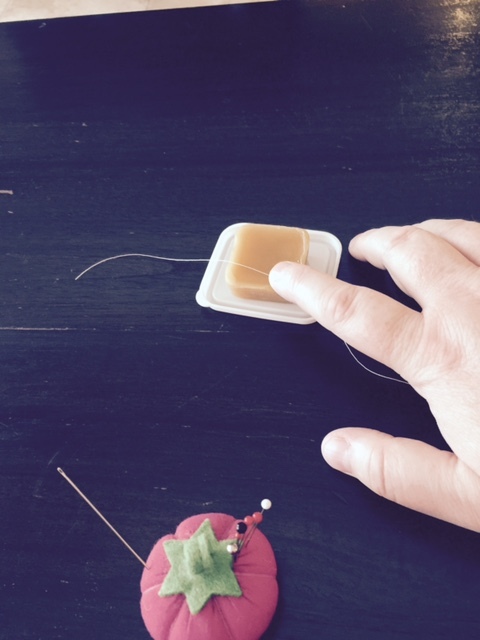 Just wax (or lick) the thread tip and pull it on through. Let five or six inches of thread dangle from one side, and the rest of the thread from the other. (Try to keep your threads about 18-24 inches long, excluding that dangling bit, for ease of sewing. Longer: less frequent re-threading. Shorter: if the thread breaks, there’s not as much of a seam to repair.) 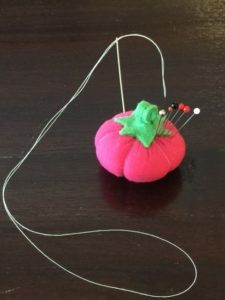 You can secure the longer end in your fabric by either tying a knot in that end, or by leaving five or six inches dangling from the first thread insertion point and then sewing it back through the other stitches when you’re finished with that line of sewing. If you want to double your thread, you have another choice to make as well: end knot or loop? The end knot of a doubled thread will function just like that of a single thread thickness, holding the first stitch in place. Frankly I hate these. Not just because a knot sticking out can itch and irritate me, but because if I make a mistake, I have to cut the thread, pick it out, and start that entire seam all over again. Also, a single knot usually isn’t thick enough to hold the thread. It may slip right through the fabric, so I always try to tie two or sometimes three overhand knots. And this happens. A lot. It’s apparently impossible for me to tie one thick knot, but two thin knots happen all the time. My personal preference is for a doubled thread with end loop. 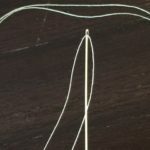 You can use that loop to tie a lark’s-head knot with your thread for the first stitch, which will be more secure than a knot — remember, knots can slip right between the threads of your fabric — and won’t make an itchy protrusion in your garment either. 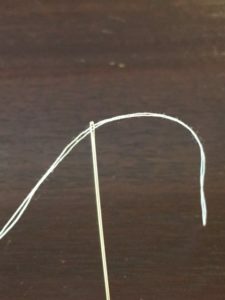 In the video below, the string is your thread, and the thread-ends are acting as their own needle; the wooden bar is the fabric you’ll be catching with your needle just before taking it through the end loop. To get this, you’ll need to wax or lick both thread ends together and put them both through the eye of your needle at the same time. Then just pull them on through. 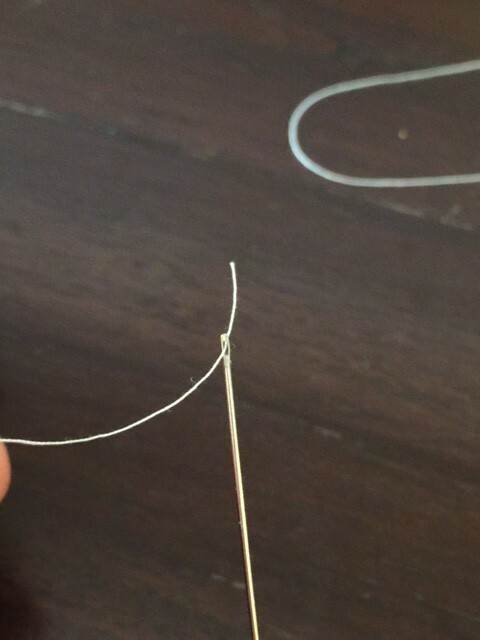 Both waxed thread ends, taken through the eye of the needle. The needle, happily threaded, sticking in the pin cushion. 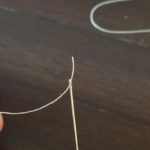 The biggest advantage of a doubled thread with an end loop is not the lack of knot at the end, but the un-secured top end. If you make a mistake, or if — make that when — your thread gets tangled, you can simply pull off the needle, untangle the thread, gently but swiftly pick out only the section that needs fixing, and proceed. No need to cut the thread and undo a foot or more of sewing. Rumor has it that Norse women dragged the thread across their forehead, oiling it. Not a bad idea, for those with oily skin. Put that to use, eh? Smart! Adding it above. The only drawback to cutting sewing thread longer vs. shorter is longer tends to tangle more.